Pets of the Homeless' mission is to feed and provide basic veterinary care to pets of homeless people in the United States and Canada. CARSON CITY, NV, UNITED STATES, July 2, 2018 /EINPresswire.com/ -- (Carson City, Nev.) – 2018 marks the ten-year anniversary for Pets of the Homeless, the only national nonprofit organization focused on feeding and providing care to pets of homeless people. 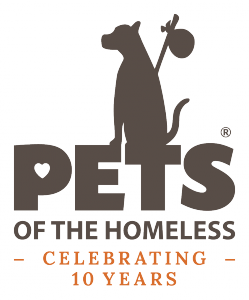 In celebration of this milestone anniversary, Pets of the Homeless will be hosting an open house on July 27, from noon-6 p.m. at its headquarters in Carson City, located at 400 West King Street. The open house will also be a celebration of the expansion of the Pets of the Homeless office space, and will be commemorated in the name of The Patricia Sharon Trust, who named Pets of the Homeless in her estate allowing for the expansion to occur. Genevieve Frederick founded Pets of the Homeless in 2006 to offer animals the food their owners could not provide. The organization garnered nonprofit status in 2008. Pets of the Homeless is a volunteer-based organization, with a simple mission – to feed and provide wellness clinics and emergency veterinary care to pets of homeless people in the United States and Canada. Homelessness is still an issue even as the economy brightens. 3.5 million Americans are homeless. 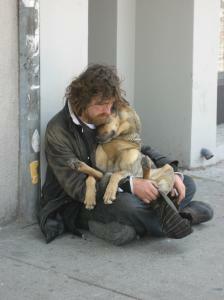 Between 5 and 10 percent of homeless people have dogs and/or cats. In some areas of the country, the rate is as high as 24 percent. Despite improvements in the economy, homelessness continues to be a reality for many people. The need for pet food and veterinary care will continue to be a pressing concern for those who find themselves homeless and the pets that rely on them. Pets are non-judgmental, and provide comfort and an emotional bond of loyalty to their owners. In some cases, they provide the homeless with protection and keep them warm. Since 2008, Pets of the Homeless’ donation site members have taken over 569 tons* of pet food and supplies to homeless shelters, food banks and soup kitchens in nearly every state and some in Canada. More than $778,000 has been provided for veterinary emergency care and wellness clinic services to over 18,000 pets. As an outreach to the homeless who own pets, Pets of the Homeless uses cash donations to provide veterinary care to pets of the homeless at free wellness clinics as well as emergency veterinary care across the country. For more information about the organization, visit www.petsofthehomeless.org. Please call (775) 841-7463 or email info@petsofthehomeless.org to RSVP for the open house. To donate to the organization, visit www.petsofthehomeless.org. Pets of the Homeless believes in the healing power of companion pets and of the human-animal bond, which is very important in the lives of many homeless. They find solace, protection and companionship through their pets. They care for their pets on limited resources so they themselves have less. The task, nationwide, is to feed and provide basic emergency veterinary care to their pets and thus relieve the anguish and anxiety of the homeless who cannot provide for their pets. For more information, please visit petsofthehomeless.org. *Approximately 50 percent of the collection sites report the amounts, so the number is actually greater.